In the majority of the feedback I receive, readers ask about the value of Elvis collectibles they own. 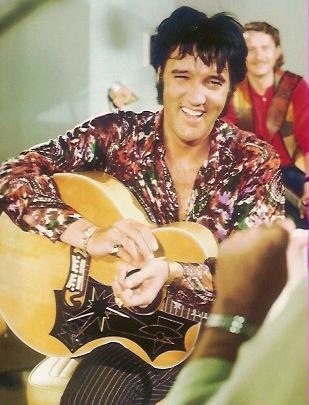 Since I’m not an Elvis collector and have no knowledge or contacts in that field, all I can do is suggest those readers put their items up for auction online and see what happens. Other readers respond with substantial comments about current and past blogs or general thoughts about Elvis. Below is a selection of comments I’ve received through elvis-history-blog.com over the past six months. We’ll start with Rita, who simply wanted to share her favorite Elvis song. Rita: I would greatly appreciate your site praising Elvis's singing “Danny Boy.” He actually sings “Danny Boy” better than any other singer and it is perhaps the best singing he's ever done! I don't know why he sang it but I sure am glad he did! I think he recorded it in the mid-seventies. Every Elvis fan should have a recording of it! Christopher: Your article on the ’68 Special would mislead others, since you imply that Elvis did not think it was very good. The truth is Elvis was quite pleased with it: (1) Both his performance and (2) the overall reaction to it from the public. And, as to his reaction, you can find it in a plethora of books on him and his comments, as he watched it, I believe, not only first with Steve Binder (and liked what he saw), but then the televised event itself with Priscilla and her parents at the Presidio, I believe, on base there in San Francisco. It was at her parents’ place and he sent out for a TV. The comment you mention is true, but it was simply Elvis, as he did quite often, engaging in self-deprecating humor. Christopher: As I was born in Baltimore and my Mom tried to get us tickets to see Elvis in May of ’77, I enjoyed your article on that concert. However, I am not quite sure I agree with you that Elvis didn't please quite a lot of people that night. Of course, I know about what happened with him going off stage, and as my uncle tells it, Charlie Hodge took over after that. And my uncle verified everything about Elvis being lethargic before he left and came back. Also, you should know my uncle appreciates Elvis, but is not a huge fan. 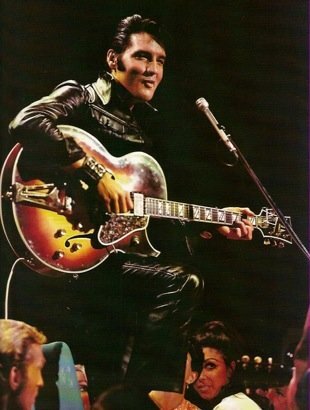 But he did tell me that after the break, Elvis was quite good and that he was very much impressed when Elvis sang "Hurt,” as he didn’t know he had that kind of range. Talk of his range and how he couldn't get over how crazy the crowd was over Elvis, at least near him, are the big things he remembers. Alan: Next, Christopher disagrees with my often stated opinion that Elvis was fully responsible for the series of events that eventually resulted in his death, and that no one could have stopped him on the road to self destruction. Christopher: I disagree, Alan. If anyone could make Elvis do something, based upon what we do know, it was Colonel Parker. Red West, Sonny West, Esposito, etc., all tried in some shape, matter. They threatened to cut off the Stanley Boys’ drugs and broke another guy’s foot. And Colonel got Elvis to marry Priscilla. Elvis was insecure and if the Colonel stepped up and said, "Hey, you are gonna lose it all if you don't do xyz," that is the best hope we had. 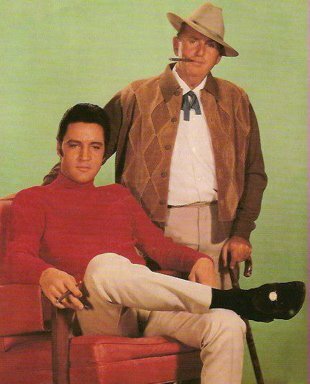 Elvis was stubborn as an ox, and in the end, really it was only the Colonel who had any sway over him. Alan: Finally, Christopher provides his thoughts about Elvis’s political beliefs. Since never spoke publicly about politics and never voted, it’s difficult to be sure about the direction and intensity of his views on politics. Christopher offers some effective second hand evidence to support his conclusions on the subject. Christopher: I know Marty Lacker and Jerry Schilling, and other Elvis friends well. Both of these men would be considered rather liberal, while Elvis was no doubt, according to both of them and his own quotes, very conservative. He was very supportive of the Vietnam War; believed in a robust military and capital punishment; was against the ERA; and was appalled by abortion I was told. He was also very, very intelligent and read the papers quite a bit and could converse on any number of subjects. I recognize your piece focuses on some quiz or interview Elvis was given in the’50s, but by the ’70s he was extremely well read and knowledgeable about everyday affairs. He was quite conservative, and that is from Schilling, who is very, very liberal. Schilling said, as far as he knew, Elvis was not registered, but if he were, Schilling said he would have been a registered Dem, but then, like so many other Dems of the South in the early ’90s, most likely became a Republican. Alan: Ron is obviously a loyal reader of elvis-history-blog.com. Back in March 2012, he let me know, in know uncertain terms, that he disagreed with my conclusion that Elvis had a total of 14 #1 songs on the Billboard pop chart. Apparently, Ron recently re-read that blog and was re-motivated to tell me I was wrong. Ron: No, Elvis didn't have 14 #1 hits. Wrong, Wrong, Wrong. You must count the Democrat way. Make that 18. No need to reply back. I’m sick of people pushing the numbers back on Elvis and his music. 18,18,18,18,18,18. Two sided hits count also because they are different songs no matter how you spin it. His records sales numbers are way too low, also counted by democrats. A record is a record no matter how long the song is or how much it cost. 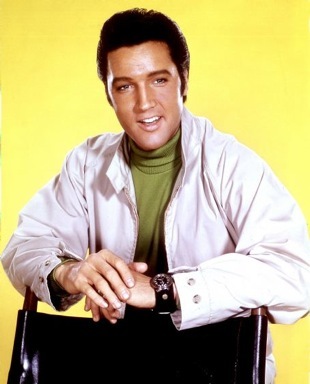 Alan: Occasionally, I hear from someone who has some inside information concerning Elvis to share. Recently, it was musician Randy Cullers who stumbled upon elvis-history-blog. com and revealed some interesting information about Presley recordings in the seventies. Randy: Wondering if you had contact information for Mr. Jorgensen. There are a couple of mistakes in his list of musician credits for Elvis (not his fault; the session cards weren't correct). The mistakes are admittedly minor, but still, it's history. I know because I was on the sessions in question. It is, admittedly, but a footnote in the story of Elvis's recordings but one that has, as time has gone by, meant more to me than in the past. It's information no one has had available. One, I'm credited with playing organ on a batch of Elvis recordings in the mid-70's. I don't play organ; I'm a drummer and percussionist. That's me playing drums on "Little Darling" and "If You Love Me Let Me Know.” It's me playing cowbell on "Promised Land" and, unbelievably, David Briggs playing tambourine on James Burton's guitar breaks. Why does it list me as playing organ? Because a foolish young drummer (me) knew there were never musician credits on Elvis albums so, thinking "who cares" put organ on his time card as a joke. I mean, what were the chances of historians going through the union time cards on Elvis sessions? Right? Regarding overdubbing on "Promised Land,” I can't remember there being any cards. Felton called me in to do some overdubs. I think it was RCA "A". It was just Felton, Al Pachuki, David Briggs and me. David was just sitting behind the board hanging out. Felton played me "Promised Land" to see if I had any percussion ideas. The intro screamed cowbell to me but I also wanted to add tambourine in the guitar breaks. Trouble was there was only one track left on the tape and I couldn't do both throughout the song so I enlisted David. Why am I playing studio drums on two of Elvis's live recordings? Felton said the live recorded sound had a problem. They had already had a problem with the Stamps performance on "Little Darlin'" and had re-recorded them. Now he had me play drums on "If You Love Me Let Me Know" and "Little Darlin’.” The later was all over the map time wise at the beginning and there was no way to correct that. Side story—I missed out on overdubbing percussion of "Burnin' Love" because they couldn't find me. I was playing basketball behind Combine Music, just next door to RCA. Whomever they sent came in the front door instead of the back like everyone else. I know in the list of world events this isn't all that important. But the people who were there are dying away with no one to tell the story. For what it's worth, I was on the tour as a tour manager to help Felton out for the last year until Elvis's death. We were sitting together at an FBO waiting for Elvis's JetStar when the Colonel called him. Felton never said a word. He just sat there. Tony Brown rushed in later saying he had heard over pilot traffic that Elvis had died.